Kwame Harris, aka Hammer, is a performer. He likes to showoff for people. That's why he became a wrestler. He was good at the job, but wanted something more. The sudden rise in super powered beings gave him the idea to become one himself. Having gained incredible strength, Kwame decided to move to Freedom city and join the Ultimate Wrestling League, an organization for super powered wrestlers. Now, he's turning his attention to helping protect the citizens from danger. In return, he hopes to spread his fame. Kwame started life as a wrestler at the late age of 25 in the Pro Championship Wrestling (PCW) organization which lasted from 2006-2014. There, he took on the name Hammer and enjoyed a productive career, but Kwame always wanted to do more with his life. So, when the PCW closed its door, instead of hanging up his time in the ring, Hammer decided to join a new organization. Kwame then signed up with Total NonStop Action (TNA). His two years with TNA gave him a chance to perfect his two signature moves: HKO - a modified version of of a flying cutter, and his finisher, Hammer Down - a double handed leaping attack. His success was limited in the organization due to his desire for a bigger stage to test his mettle. By 2015, the world had fully embraced the existence of metahumans. Word of the Ultimate Wrestling League in Freedom City had spread and the profits were finally piling up. Kwame wanted in on the action so he began researching ways metas had appeared. Through his research, he learned of the various designer drugs on the market that would give a person superpowers. 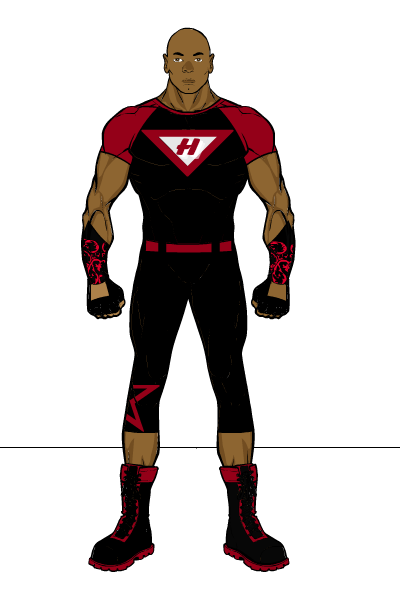 IMAGE GALLERY: Hammer wears a black t-shirt with red shoulders and a red H centered insignia. He has black fingerless gloves that cover his forearm. The area on the forearms has a red intricate design. His black pants cover 3/4 of his legs, leaving his calves bare. A red outlined star adorns the left leg. A red leather belt defines his waist. Hammer wears tall black boots that have a bit of red them. The costume was given to him when he joined the Ultimate Wrestling League. Hammer has displayed enhanced strength and constitution. He also has super strength that he has managed to adapt to his wrestling style of fighting. Through the use of his improve musculature, Hammer has displayed the ability to leap far and run faster than normal humans. As he has just gained his powers, he has not learned how to use his strength from a distance other than throwing objects. DC 10 Hammer's real name is Kwame Harris. He was once a TNA wrestler. DC 15 His powers seem to be purely strength based. He is extremely resistance to damage. He tends to use wrestling moves when fighting crime. DC 20 He recently gained powers and has joined the Ultimate Wrestling League. DC 15 He started his career at the age of 25 with the Pro Championship Wrestling organization in Chicago. DC 20 Hammer has started working as a hero in Freedom city. DC 25 Hammer had some dealings with a known drug pusher, Gently Cross, a few years ago. DC 30 Hammer received his powers by taking a number of drugs. DC 40 The chemicals that Hammer had taken to gain his power was a mixture of the Power-House formula and the DNAscent process. New Town, New Beginnings: Kwame Harris, aka Hammer, arrives in Freedom city to join the Ultimate Wrestling League. WNTW Channel 3 - Action News: Action News reports Kwame's first act of heroism. New Day, New Job: Kwame gets an introduction to the workings of the Ultimate Wrestling League. Peace On Earth, And Mercy Mild? : Kwame joins in on the Christmas celebration that has hit Freedom city. A Friendly Game: Hammer tries to get other heroes to play a game of flag football and mingle at Liberty Park. Heroic Tech Support: Hammer meets with Endeavor for help setting up his online profile. Beeing Schooled - [Vignette: February 2017, Bees] A giant bee decides to learn how to wrestle. One First Shot - Hammer debts with his wrestling team.